If you have been taking part in regular exercise before becoming pregnant then it's great to continue through pregnancy, as long as your GP or midwife is happy with this. If you have not been exercising before pregnancy then it's best to talk to your GP or midwife about increasing your physical activity, such as walking and pelvic floor exercises. Discuss your Plan to Exercise with your GP or Midwife. Also report any unusual symptoms if they occur once you have started to exercise. Don't Exercise if you Feel Unwell. After the 1st Trimester - Avoid Rotational Exercises. E.g. russian twists and side bends, as working the obliques may contribute to abdominal separation (diastasis). After the 1st Trimester - No Supine Exercises (lying on your back flat). Replace these with kneeling or standing options, more info below. Avoid Prone Exercises (lying on your front) as soon as they are uncomfortable. Studio Classes. 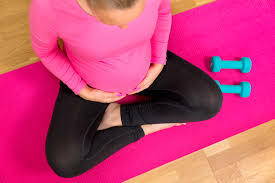 Most should be OK but you may need to adapt certain exercises, always let the instructor know that you are pregnant at the start of the class. Looking for a Prenatal Fitness class will take away the worry about the exercises - book a free Pregnancy Fitness Class here. Resistance Training is safe and beneficial during a normal uncomplicated pregnancy. You may need to reduce your load through the trimesters. Aerobic Exercise is great for delivering blood, oxygen and nutrients to you body's tissues. Aim to maintain your current fitness levels. Avoid Extreme Rotational Movements of the Spine. Wear a Supportive Bra and Appropriate Footwear. Safe Stretching. Stay within your normal range of motion and avoid developmental stretches - maintenance stretches only. Avoid Sports that may cause you to lose your balance and/or fall. Such as horse-riding, skiing, gymnastics, water-skiing or skating. There are some warning signs which mean you should stop exercising. There are also some health conditions which make it unsafe for you to exercise without consulting your medical professional. We have listed these further down - please ensure you read these if you are considering making any changes to your physical activity levels. Pregnancy is not the time to take up running if you haven't done it before, walking, stationary/indoor cycling or swimming are brilliant alternatives. 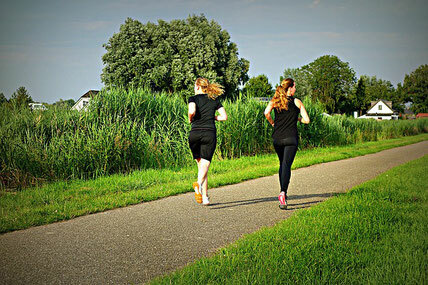 If you ran before pregnancy then it should be OK to continue, always modify if you feel uncomfortable at any point. You may need to reduce to jogging through the trimesters. After the first trimester, avoid exercises lying on your back like the chest fly or lying stretches. You can use a bench to incline your body or change to seated, kneeling or standing versions of the exercises. No Lying on your back for exercises after the first trimester. Your pelvic floor has many functions! Works with the deep abdominal muscles to stabilise the spine and support the bladder, bowel etc. Prevents leaks of urine, gas and poo. Supports the weight of your baby and uterus. Promotes rotation of your baby during birth. Relaxes and stretches during childbirth. The effects of relaxin (pregnancy hormone) and the weight of your uterus and baby can leave your pelvic floor stretched and weakened - even if you have a c-section. This can leave it less functional and may result in incontinence and in worse cases can lead to prolapse. Therefore, its super important to strengthen your pelvic floor throughout pregnancy. Breathing is a huge part of pelvic floor activation! Read below and then practice with the video. On the inhale, the rib cage expands and the diaphragm move down - this relaxes the pelvic floor. On the exhale, the diaphragm and pelvic floor muscles lift together. For more on pelvic floor, check out our Pelvic Floor blog post here. You could try a pelvic floor workout app which sends you notifications to remind you to do the exercises daily. Squeeze your pelvic floor whilst driving, try fast and slow squeezes. An antenatal fitness class will also help you with your pelvic floor. During pregnancy we want to prepare for childbirth and motherhood and aid post-birth recovery. A prenatal specific exercise class should include appropriate core and pelvic floor training to do this. Activating your TVA (deep core muscles) helps to stabilise your spine as baby and uterus grows, and helps to minimise the risk of diastasis (abdominal separation). Abdominal Hollowing is a great way to activate your deep core muscles (TVA), this involves pulling in your abdominal muscles (belly button towards your spine) without moving your rib cage, pelvis or spine. You also need to be able to breath whilst doing this. This can be practiced laying on your front (if comfortable), on all fours (box position), seated or standing. This should be practiced and used with other exercises like squats, lunges, pelvic floor practice, any weights/resistance training etc. Supine exercises included sit-ups, crunches, reverse crunches etc to be avoided after the 1st trimester. Rotational exercises including russian twists and wood chop to be avoided after 20-weeks. If twins are expected then follow the above guidelines through the first trimester too. Relaxation activities to unwind and relieve stress is highly recommended. We include a relaxation cool-down section in our pregnancy fitness classes, come and give them a go by booking your free session here. Weight gain during pregnancy is healthy and absolutely normal! This weight includes your baby, uterus and placenta. Trying to lose weight during pregnancy is not recommended but a healthy diet, vitamin supplementation and physical activity will benefit both you and your baby. Click here to go to our 'Healthy Eating through Pregnancy' blog post for healthy eating guidelines during pregnancy, meal ideas and recipes. Click the photo to go to our FREE Healthy Eating Recipes. can i exercise if i haven't before pregnancy? 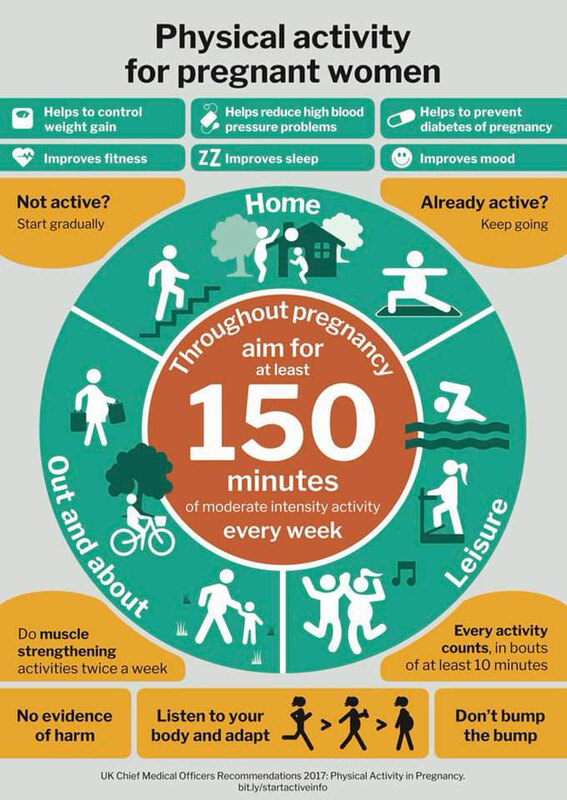 Always talk to your GP or midwife about increasing your physical activity if you have not exercised before pregnancy. Walking and pelvic floor exercises should be able to be introduced and gradually increased over time. See the exercise warnings below. 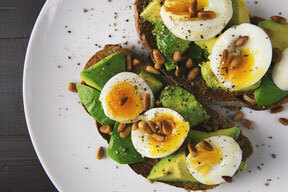 A great way to feel healthier through pregnancy is to eat nutritious food for you and baby, check out our Healthy Eating through Pregnancy blog post here. Pregnant with twins (or more than one baby). Persistent Bleeding (2nd & 3rd Trimester). Placenta Previa (after 26 weeks) placenta in lower, non-contractile part of uterus. Premature Labour during current pregnancy. Bleed, gush or fluid loss.